DENTON (UNT), Texas — It’s not uncommon to hear an old slave spiritual or a bit of jazz coming from Harold Woodard’s classroom. But this is no music class. For Woodard, the music, specifically ranging from the Father of Gospel Music Thomas Dorsey’s “Take My Hand, Precious Lord” to Marvin Gaye’s “What’s Going On” has a purpose: elevate a group that often has the highest risk for dropping out of college. “When you look at aggregated retention and graduation rates, at the bottom of that list are African American males,” said Woodard, who is the program director for Strategic Retention Initiatives at the University of North Texas. Nationwide, there are both gender and racial/ethnic gaps in college. As the latest data shows, 67.5 percent of males who recently finished high school enrolled in two- or four-year college, compared with 71.9 percent of women, according to National Center for Education Statistics reports. Of the men who do enroll, they’re less likely to graduate than their female counterparts. And if they’re African American, they’re least likely of all. 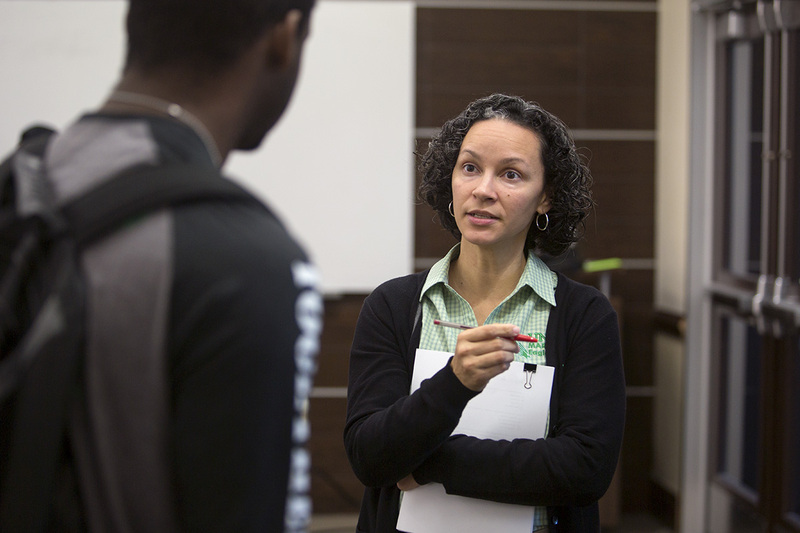 However, Woodard hopes to change that statistic through UNT’s MARTIAL Eagles program, which aims to attack the indicators that most affect male student success and retention. 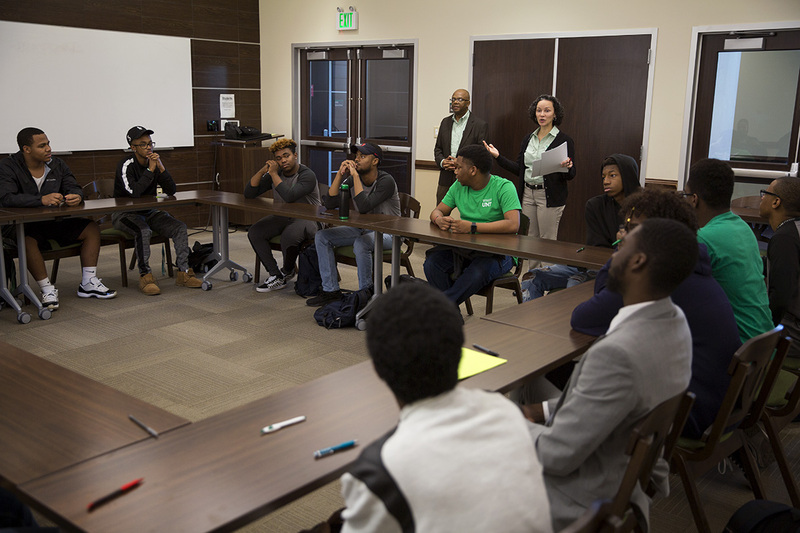 The program – which stands for Male Alliance for a Rigorous, Transformative and Interdisciplinary Approach to Learning – brings together young men, of any ethnicity, who want to learn about the historical and cultural experiences of Black males in the U.S. via the lens of music. Students live together on campus, participate in mandatory study sessions, receive mentoring and are enrolled in a seminar-style class for freshmen. Half of the course teaches them things like effective study habits and how to use on-campus resources. The other half of the course focuses on music. On those days, students learn about how African societies used music to communicate and celebrate life, how those who survived the middle passage used songs to maintain some level of sanity, and how songs played a part in slave resistance during the Antebellum period. Woodard, who started the program with colleague Candi Harris, a senior student success coordinator for Strategic Retention Initiatives, says music attracts students to enroll. Harris says the small setting allows them to build relationships with students and to customize any interventions or referrals to fit the needs of the individual student. Freshman Brevin Beard says he’s never had a class like this. 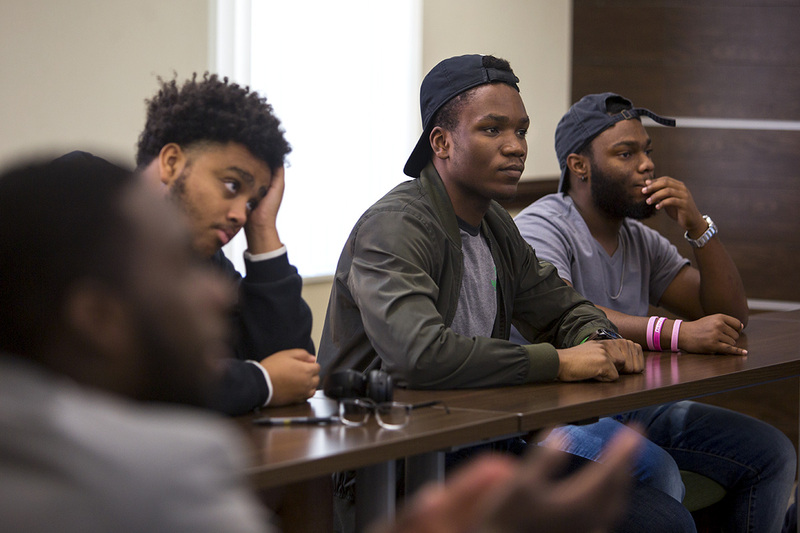 “They go through African American history through the years and detail how they survived, and sometimes thrived, despite the circumstances they experienced,” said Beard, a student in the College of Business. It’s through those shared experiences that Woodard connects with students. “I grew up in a segregated community, and there were a number of experiences that have allowed me to speak to issues and give perspectives about how far we’ve come and how far we have to go,” said Woodard. While the program is still new, having only launched during the 2017-18 school year, it is proving to be effective. In its first year, the MARTIAL Eagles cohort outperformed its comparison group. 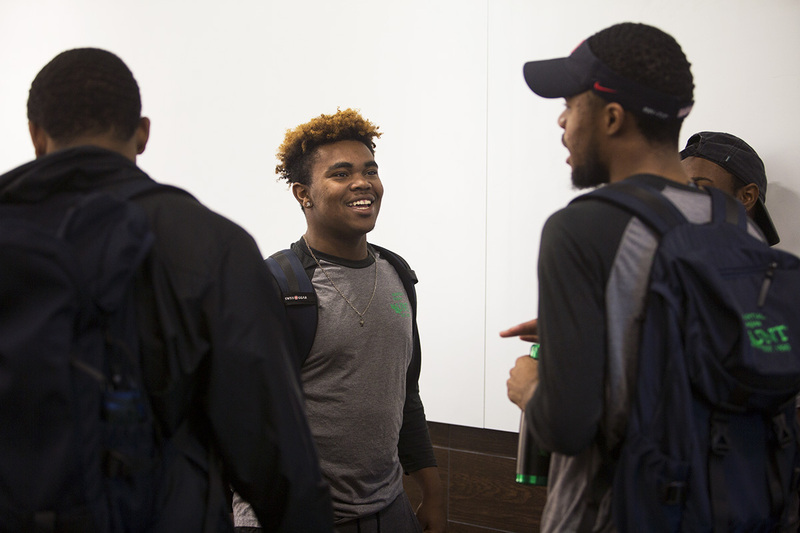 Participants earned an average 2.72 GPA, completed more credit hours and achieved a higher, one-year retention rate than both their African American peers and all male students at UNT. But for students like Beard, the beauty of the program comes not through the data or even the music, but rather, coming to a better appreciation of self. 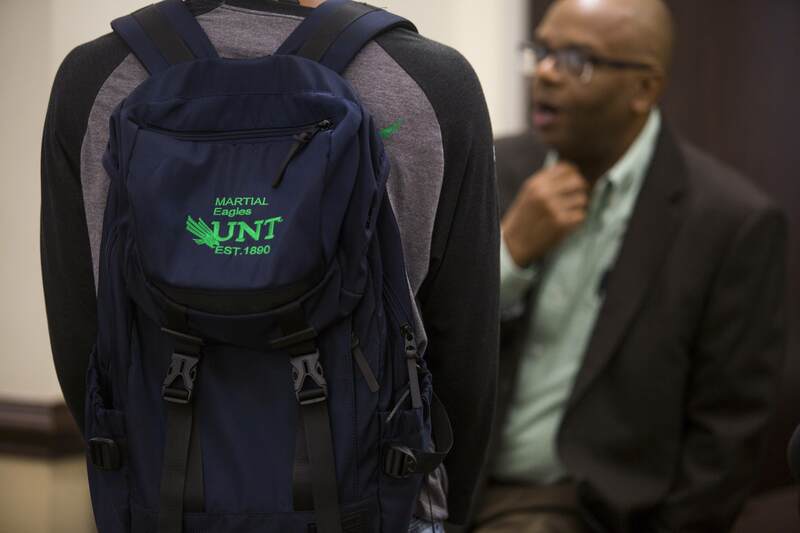 In this Q&A, Harold Woodard, program director, and Candi Harris, senior program coordinator of UNT’s MARTIAL Eagles program discuss the initiative that they started in 2017. 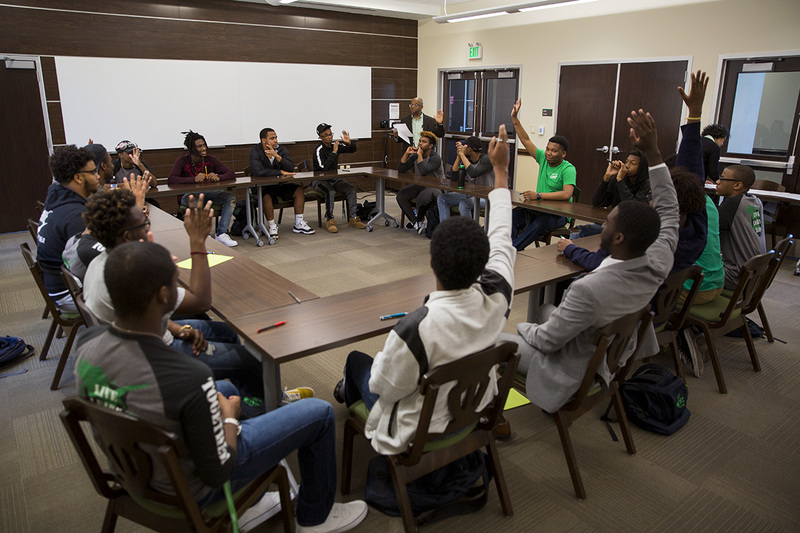 The UNT Male Alliance for a Rigorous, Transformative and Interdisciplinary Approach to Learning (MARTIAL) is a small community of young men who share an interest in the historical and cultural experiences of African American males in the United States. Students also choose to work towards academic excellence in their chosen fields of study while living, learning, and leading together in Rawlins Hall. Click through the slideshow for more of their answers. Where did the idea for MARTIAL Eagles come from? HW: This is a program that Candi Harris and I started together. I drew from my prior experiences directing a student success center at The University of North Carolina – Chapel Hill. Additionally, Candi has experience with men of color programs at her alma mater, Sam Houston State University, where she started the THECB-recognized ELITE program, and at UNT with a group of Emerald Eagle Scholars through a Title III federal grant. She had amazing preliminary outcomes in both programs in terms of helping students transition successfully from high school to college. We were initially approached by UNT Housing to submit an application to develop a Living Learning Community, and I recognized that as a chance to use a number of best practices for student retention and success in academia. When I was hired, I was assigned the task of addressing populations like this that are at highest risk. When you look at disaggregated retention and graduation rates, at the bottom of that list are African American males. With that, we structured everything about this program with best practices in mind. For instance, the Living Learning Community is one. We then combine that with the first-year seminar approach in which you introduce college transition skills – things such as studying, note taking, time management and test taking. Another best practice we’ve implemented is mentoring from me, Candi, others on campus and even alumni. What was the intention behind launching this program? HW: We wanted to build a community of like-minded young men with a drive to succeed. I also wanted to design a program that would be open to any male student and still attract a large amount of African American males. Additionally, I wanted to draw on UNT’s tradition of musical excellence because I knew that would be an attractive topic for students. That’s when I created the idea for a thematic program on the history and culture of African American males through the lens of music. CH: It is exciting to see UNT continue to grow as a diverse institution as more and more traditionally underrepresented students choose UNT first; I think that certainly speaks to the welcoming environment. However, the clear gaps in graduation rates when you look at data by gender and race/ethnicity speak to the continued need for programs like this. I believe we can do more to help not only our African American men, but all students to graduate and go on to better our communities worldwide. MARTIAL Eagles is our attempt to do just that with our African American men. The Living Learning Community concept and particularly the freshmen seminar course serve as the platform through which we offer regular, consistent guidance to students. The opportunity here is to engage them weekly in highly focused discussions about how they navigate through their new environment. We place a priority on academics, setting high expectations that students attend classes and study sessions regularly and that they make use of the academic support services on campus. The small community setting allows us to build solid personal relationships with students so that we are able to customize any interventions/referrals to fit the needs of the individual student. While there are various forms of living learning communities and first year seminars, the concepts are generally seen as high-impact practices in higher education and I believe these programs could benefit all students including those who have transferred to UNT or who identify as first generation. What does the name MARTIAL Eagles stand for, and is there any additional significance behind the name? HW: Once we had everything in place, we needed a name and we wanted to make our mascot relevant. That’s where the martial eagle, the largest eagle in Africa, came in. From there, we needed an acronym, and I knew I wanted every letter to count. Male Alliance: I knew from the beginning that I wanted an alliance of men. Rigorous: I wanted to signal that this is not some fluff initiative. This is not some easy, kind of rap session. This is not play time. This is something serious. So, I chose the word “Rigorous” to make it clear that we are developing critical thinking skills among these young men. That requires teaching information to engage them and process real life dilemmas. That topic is tailor-made for reflection and thinking in depth about issues that in many cases have had life or death consequences. Transformative: I also wanted it to be transformational and signal that “I’m no longer in high school” and for the students to think of themselves differently as to who they want to become. Interdisciplinary: This topic is interdisciplinarity. You cannot understand the history of African American males one dimensionally. We learn about geography, paleontology, anthropology, government policy, sociology and history. Approach to Learning: The whole key here is learning. You don’t get to be a wallflower in my class. Part the task of developing critical thinking skills is forcing student to think. Every day, I start with a quiz. Then, I focus on the problem areas with a team-based learning approach in which the group has to wrestle with each other about what is the correct answer. This also helps them talk and overcome whatever fears student may have about addressing groups in public. 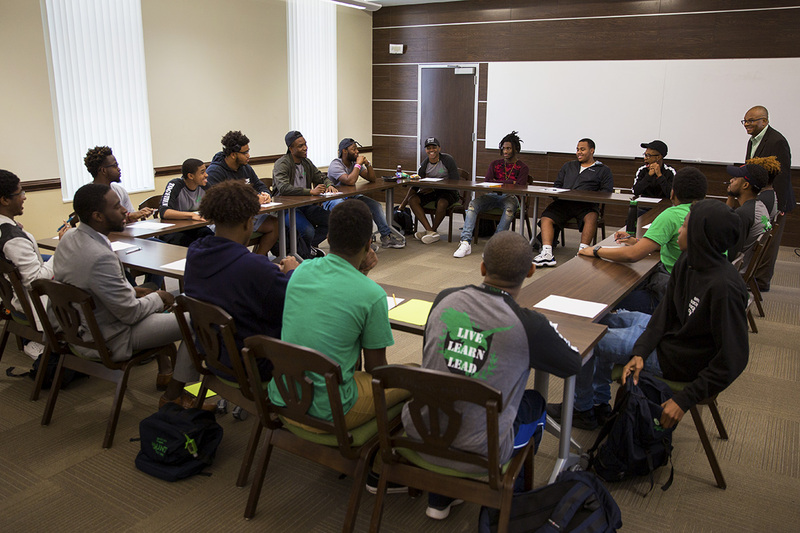 UNT is on its way to becoming a minority serving institution. And while this program is not solely for minorities, it is targeted toward a minority population at UNT. Is there a need for a program like this, given the university’s growth as a diverse institution? Also, are African Americans the only students who could benefit from such a course? HW: This class is not exclusively for African American males. It truly is open to any freshman male. Anyone can benefit from exploring this topic because they can learn about resiliency and creativity in the face of sometimes overwhelming oppression. It’s something that can be downright inspirational. In many ways, we have a diverse class. For instance, we have some students who are first generation and we have some who are not. I happen to be first generation. My experiences resonate with some of them. As an African American male, I’ve experienced some things that I think are relevant to what they’re going through. I’m of a different generation, but they remind me constantly that some of the things I encountered in my childhood are still relevant today. I grew up in a segregated community, and there were a number of experiences that have allowed me to speak to issues and give perspectives about how far we’ve come and how far we have to go. Is this program working when it comes specifically to measuring student retention and other key indicators? CH: At the end of the Fall 2017 semester, preliminary data from UNT’s Data, Analytics and Institutional Research office indicated that the inaugural cohort of MARTIAL Eagles outperformed its comparison group in average hours earned and GPA. The MARTIAL Eagles earned 13.27 credit hours versus the comparison groups’ 9.95 and an average GPA of 2.46 compared to the comparison groups’ 1.84. Note that all male incoming FTIC students earned an average of 12.08 credit hours and an average GPA of 2.60. At the Fall 2018 census date, more MARTIAL Eagles returned for their second year (higher one-year retention rate) hours. These are short-term data that point towards the possibility of longer-term success with this program. I hope to have the opportunity to continue working with these students over the next few years to see if this program has any impact on graduation rates. How do you juggle the individual needs of students with running this and your other job responsibilities? HW: Getting all of this done with just a staff of two full-time employees can be overwhelming at times. It requires tremendous commitment and careful time management. I have to add that I really could not have done this without Candi Harris. The expertise the sensitivity and the creativity that she brings to this is incredibly important. Of course, that’s one if the reasons I hired her. She is really the backbone of the MARTIAL Eagle effort. CH: Managing a program like this requires quite a bit of time to say the least. To be most effective in terms of a student-first approach, I think you have to dedicate a lot of energy into building relationships. At the same time, there are so many administrative tasks involved in the basic operation of the program from event planning and purchasing to managing a budget and following through on reporting responsibilities. It’s worth noting that MARTIAL Eagles is not the only program this two-person shop is responsible for. So, juggling? Yes, we do a lot of that, but I’m not sure I can fully articulate how! I suppose it’s a matter of setting daily priorities and trying to stick to the list. I do know that having a great relationship with students matters because sometimes you have to say no to unscheduled meetings because you are trying to finally complete a few urgent tasks. Because of past chats and weekly interactions, students know you care; they understand that at that particular moment, they’re not being “shoo-ed” away just because. They know they’ll have the opportunity to engage again at one of the many touchpoints throughout the week. Additionally, as a professional, you learn to say no where you can to keep afloat. I’m getting much better at that. How can MARTIAL Eagles serve as a model for other faculty and staff at UNT who want to better connect with students? CH: Many of our colleagues across campus are already doing a great job of connecting with the students on their radar. Though I’ve experienced success with similar projects in the past, I will point out that MARTIAL Eagles is in its infancy. We are working daily to improve the overall structure and methods of holding students accountable to the opportunities to reach their goals. With that, I think the only advice I feel qualified to offer in terms of this program as a “model” would be to join us in raising the bar – or hang in there with us if you already do. I know many of our students face challenges in their life. As a former Hall Director, I used to live with over 500 of them. And I sincerely think that UNT has a tremendous support system in place in terms of resources like the academic support centers, the counseling center, the food pantry and many others. What I have learned in my short life though, is that there will always be challenges. UNT has the opportunity to daily help our students learn how to succeed in spite of these challenges. How to commit to something and stick with it. How to ask for help instead of settling for mediocrity. How to press on. While there is no class dedicated to this idea, we can all promote the message in our unique roles on campus. We can all hold students accountable for doing the things they say they’ll do and, while they might fail a few times in attempting this, we can all be there to help them back up until they get where they’re trying to go. HW: The significant part of this is that I wanted these young men to start off in a community of like-minded folk, but I did not want them to remain isolated as a group. This is not meant to be a sheltered kind of experience. This is an opportunity to develop some skills, but what I really want is for them to engage the campus population. I want someone to run for the Student Government Association. I wanted some of them to do study abroad and complete faculty-mentored research. This is about preparing individuals for life after graduation. I want them to engage the broader community around them. CH: Even when they’re driving me nuts, I love these guys!